The U.S. Department of the Interior announced on Thursday the downlisting of the West Indian manatee from endangered to threatened. 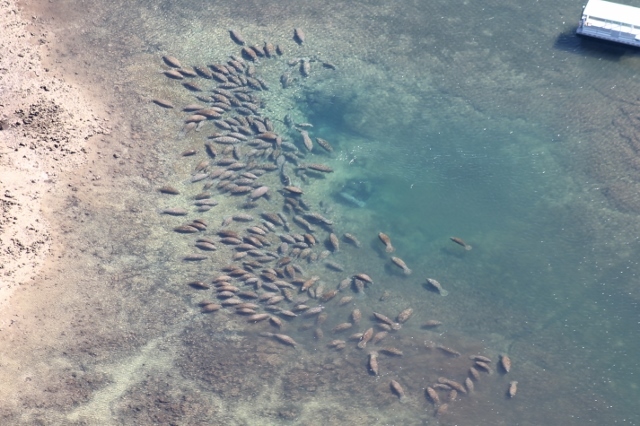 Notable increases in manatee populations and improvements in its habitat allowed the U.S. Fish and Wildlife Service (FWS) to change the species’ status under the Endangered Species Act (ESA). The downlisting means that the manatee is no longer considered in danger of extinction throughout all or a significant portion of its range, but is likely to become so in the foreseeable future without continued ESA protections. Reclassification of manatees has been pending since 2007, when the USFWS first announced its intention to move manatees from the endangered list — meaning they were in imminent danger of extinction — to the “threatened” list, meaning they possibly could become at risk of extinction in the foreseeable future. Today’s estimated population of 6,620 Florida manatees is a dramatic turnaround from the 1970s, when just a few hundred individuals remained. But the manatees' continued high population count could spell trouble for the dying Indian River Lagoon. That's because an 800 to 1,200 pound adult sea cow can eat up 10% to 15% of its body weight daily in aquatic vegetation which mostly consists of seagrass. As the below graphic shows, there appears to be an inverse relationship with the manatee population counts and seagrass acreage in the Indian River Lagoon whenever the manatee count exceeds around 1,700 on Florida's East Coast. For the fist time in the decades-long debate between manatee activists and the boating community, the Florida Department of Environmental Protection (FDEP) acknowledged that the increased manatee population does have an effect on nutrient load and seagrass loss in the Indian River Lagoon following a Brevard Times investigation in 2014. 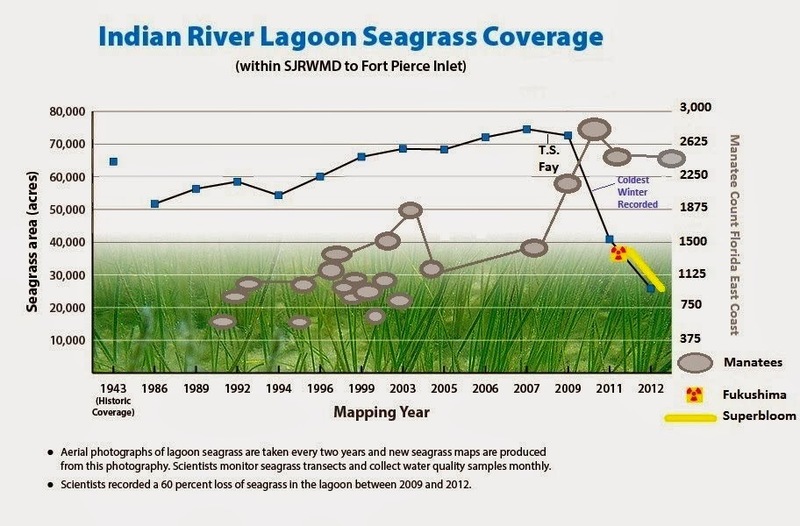 "At the time the seagrass TMDLs were developed [in 2009], manatees were not considered as major nutrient contributors to the Indian River Lagoon because not all the data needed to quantify the manatee nutrient contribution were available. It is worth noting that manatees have been part of the Indian River Lagoon ecosystem for a long time," FDEP stated in an email to Brevard Times. "Based on the Department’s Nutrient and Dissolved Oxygen TMDLs for the Indian River Lagoon and Banana River Lagoon report (FDEP, 2009), the long-term annual average TN [Total Nitrogen] and TP [Total Phosphorous] loads entering the Indian River Lagoon system are about 1511 tons and 216 tons, respectively. The 25 to 109 tons of TN and 2 to 7 tons of TP contributed by manatees only account for about 1.7% to 6.7% of TN loads and 0.7% to 3.0% of TP loads entering the Indian River Lagoon system." “Manatees should actually be classed as a “recovered” species — meaning they are neither endangered nor threatened, and not listed within the ESA," said Robert Atkins, president of Citizens For Florida’s Waterways, a Brevard County-based advocacy group for recreational boaters. Atkins notes that delaying the decision longer than the decade it has taken would be a disservice to the integrity of the Endangered Species Act (ESA). "The people must have faith in the honest assessment of Government Agencies." In this case, Atkins emphasizes that the best available science confirms there is zero chance of manatee extinction over the next 100 years. But the Save the Manatee Club contends that the declassification was premature and blames the Trump administration.